Lo and Behold! It has finally happened. Feature phones, which have been on the rise since the start of mobile revolution in India have for the first time seen a drop in their sale. According to CMR report, in the last quarter, July-Sep’13 that is, the total shipments of mobile increased by 10.9% to 62.9 million. The feature phones however saw a dip of 0.8% in the shipment. The figure is minuscule but is still there. It is more important because along with this figure is the increase in sale for smartphones. The increase is a whopping 152%. This is a trend that is likely to continue in the future as well. By the end of next quarter we might see accelerated decrease in feature phone sales. With the falling prices of Smartphones, the attraction towards them is increasing consistently. Indian companies have played a huge role in it. In the smartphone arena, nearly half the market share belongs to them and they have certainly brought the smartphones to the masses. In the sub-10k range, the Indian companies like Micromax, Lava, Spice etc. have a plethora of offerings both in the smartphone and the tablet segments. Samsung remains the market leader in the smartphone segment with 33.9% share followed by Micromax (19.7%) and Karbonn (9%). 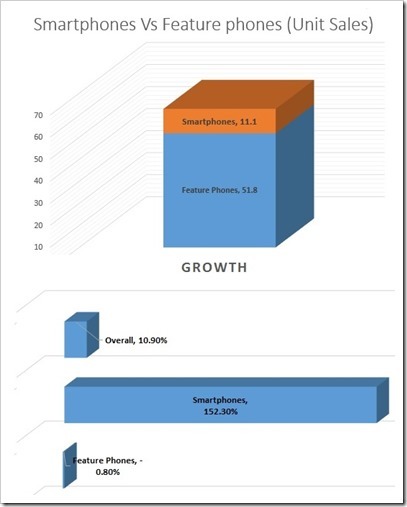 Overall however, Nokia still rules the roost with 18.9% market share. It is followed by Samsung (12%) and Micromax (10%). This shows how much faith Nokia had generated over the years with Indian audience. I still feel it’s a shame that Nokia so vehemently opposed Android. I strongly believe that if Nokia had released an Android phone, people would have jumped to it without looking at Samsung twice. The most interesting data-point is the actual figure of shipments. Out of the 62.9 million phones, 51.8 million phones were feature phones while only 11.1 million were smartphones. This shows the amount of potential that is still untapped for the smartphones to capture. With the rise of internet connections on phones (both 2G and 3G) and the falling prices, it is obvious that the growth of smartphones will continue. Another important thing is that while most feature phones are value phones (or budget phones), thereby having less margins for their manufacturers, smartphones (especially above Rs. 20k bracket) give huge dividends to their manufacturers. This means that while the shipments for feature phones might still take a long time to be surpassed by smartphones (a year or two perhaps), the revenue and profits from smartphones will definitely overshadow feature phones before that. It might already have. All in all, the downward trend for feature phones has arrived and with the amount of feature phones in the market, the smartphones have a lot of space to expand into. When do you think the feature phones will finally be overtaken in sheer numbers by Smartphones?